The Gluu Server bundles the free open source Shibboleth SAML IDP to support outbound SAML single sign-on (SSO). To include Shibboleth in any Gluu Server deployment, opt in when prompted during Gluu Server installation. In an outbound SAML SSO transaction a website or application (known as a Service Provider, or "SP") redirects a user to a designated identity provider (IDP) for authentication and authorization. The IDP will authenticate the user and upon successful authentication, the user is sent back to the SP with an active session. Trust must be pre-established between the IDP (Gluu Server) and SP (target application) in order for the transaction to work. The following section of the docs cover how to configure the Gluu SAML IDP for SSO. If you need to support inbound SAML to integrate with external partner or customer IDPs, review the inbound SAML authentication guide. 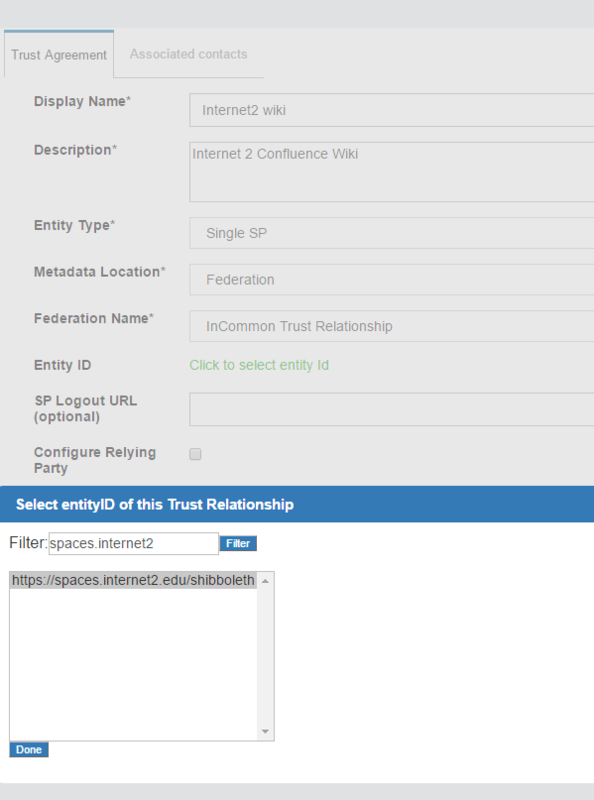 In the Gluu Server, the SAML IDPs SSO configuration is called a Trust Relationship (TR). Each TR requires the infomation listed below. Metadata is an XML file which has configuration data used to establish trust between the website (SP) and IDP (Gluu Server). Websites (SP) can provide metadata via a URL or as a separate file. Metadata can change, so a static URL typically requires the least amount of ongoing maintenance. The Gluu Server's SAML metadata may be needed from time to time. It can be found at https://hostname/idp/shibboleth. Each SP may require one or more user attributes from the IDP in order to grant a person access to a protected resource. Required attributes vary depending on the application, and should be explicitly specified in the target application's documentation. The administrator can use the oxTrust interface to release the necessary attributes to the SP as described below. A NameID or Name Identifier is used to identity the 'subject' of a SAML assertion. The format of nameID can be anything but is typically emailAddress. Create your custom attribute by following this guide. 'Attribute Base': Attribute value to calculate name Identifier. 'Attribute Name': Custom attribute name which we created earlier here. 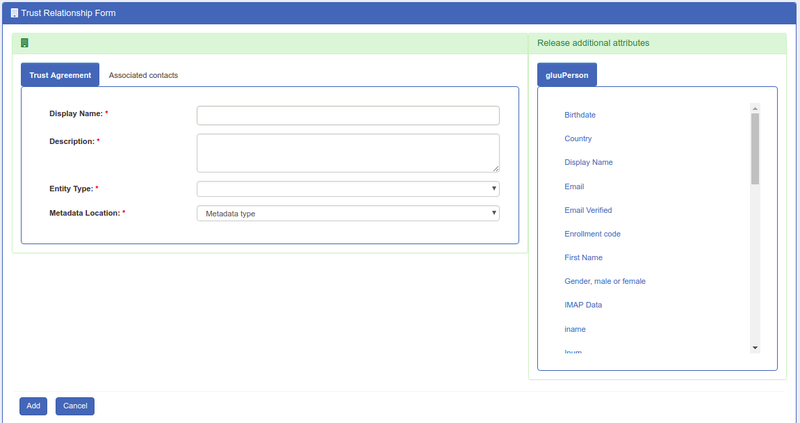 It's also possible to configure NameID through configuration file / velocity templates. The template file for NameID definitions are located in the attribute-resolver.xml.vm file under /opt/gluu/jetty/identity/conf/shibboleth3/idp/. The example below adds customTest, which we created earlier here, as NameID based on UID attribute. The following are put into the attribute-resolver.xml.vm file. The Gluu Server supports force authentication out-of-the-box. Including ForceAuthn=true in the initial SAML request from the SP signals to the IDP that the user must reauthenticate, even if they already have a valid session at the server. This feature can be used to verify the user's identity prior to granting them access to highly protected resources. 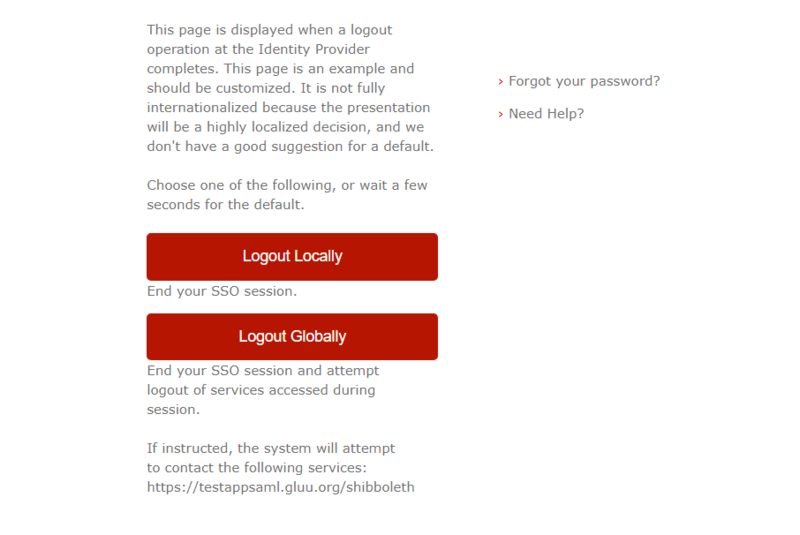 Upon receiving the SAML request with this flag, the IDP will invalidate its session for the user, then will issue a new OpenID Connect (OIDC) authorization request to oxAuth, including the prompt=login parameter. This parameter forces oxAuth to invalidate its session as well. The user will then follow the full authentication procedure. A new page will appear where you can provide all the required information to create a Trust Relationship(TR). Entity Type: You have two options to choose for entity type. File: Choose File if the SP has provided an uploadable metadata document in XML format. URI: Chose URI if the SP metadata is hosted on a URI that is accessible from the Internet. Federation: Choose this option if the target application (SP) is affiliated with a federation service (e.g. InCommon, NJEdge etc.). Fedeartion's TR must be created first for it to appear in this list. Learn more about working with a federation below. Released: The SPs required attributes must be added to this panel. The required attributes can be selected from the menu on the left with the heading “Release Additional Attributes”. The Trust Relationship (TR) can be added by clicking the Add button located in the lower left side of the page. Through the Relying Party configuration you can customize how different IDP profiles will respond to requests received from the SP, including encryption and digital signature options. The underlying IDPs functionality is described in the Shibboleth wiki. The "Configure Relying Party" checkbox is accessible on the TR creation page and must be enabled with a specific profile(s) selected as active for this TR to generate a valid configuration. In most cases, just adding the SAML2SSO profile with default settings will suffice. Setting the checkbox will result in a link which, if clicked, will summon a list of profiles currently available for customization. Each entry in the list has a brief description of its purpose and a selection of settings for which custom values may be chosen, as can be seen on image below. 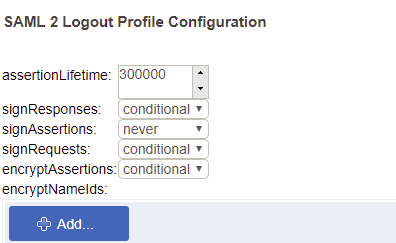 oxTrust allows you to tweak a limited subset of profiles mentioned in the Shibboleth wiki. The SAML2SSO profile is the most commonly used browser SSO profile. Once enabled, the user can be directed to https://[hostname]/idp/Authn/oxAuth/logout when they wish to log out. The user will be directed to a confirmation page. If the user clicks Yes or just waits a few seconds, the session will be killed and the user will be logged out. If the SP is part of an identity federation such as InCommon, the Gluu administrator has option to establish a Trust Relationship with it based on the federation's metadata. To achieve this he must add TR for the federation in the Gluu Server first. This will enable the administrator to more easily create TRs with SPs in the federation. 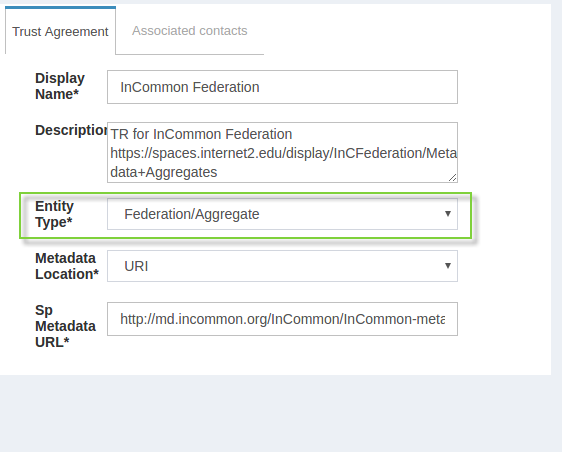 The example below shows how an administrator would add a TR for the InCommon Federation. Once a TR has been established with the federation, the Gluu Server administrator can easily create TRs with any SP included in the federation by selecting the federation from the Federation Name drop down menu and selecting the entity-id for the SP. In the example below we are creating a TR for the 'Internet2 Wiki', which is an InCommon Federation affiliated SP (meaning, the SPs entityID is available in InCommon metadata). If your target application (SP) does not already support SAML, we recommend using the Shibboleth SP web server filter to secure and integrate the application with your Gluu SAML IDP.